After the success of the Academy Award-winning Terms of Endearment (1983), James L. Brooks spent a few years to research and write what could possibly be his most personal film to date: Broadcast News (1987). Drawing from his years in television, including a stint with CBS News, he took a spot-on look at the ethics of journalism and filtered it through a love triangle between people who work at a network affiliate T.V. station. In short, Brooks’ film is the Bull Durham (1988) of journalism films – smart, funny, insightful and even poignant in the way it looks at the people who deliver us the news on our T.V. screens every night. In some ways, Broadcast News anticipated the dumbing down of televised news so that nowadays there is a whole generation of people who prefer The Daily Show satirizing today’s top stories over watching the real thing on the major networks or CNN. Tom Grunick (Hurt) is a slightly dimwitted hunk that aspires to be a hard-hitting investigative journalist but is clearly suited to be a news anchorman. Aaron Altman (Brooks) is a super-smart news reporter that lacks on-screen charisma – basically the polar opposite of Tom. The object of their affection is Jane Craig (Hunter), an intelligent control freak and T.V. news producer. She finds herself attracted to Aaron, her intellectual equal, but drawn also to Tom’s hunky good looks. At some point, she must make up her mind and decide who is worth loving and who isn’t right for her. 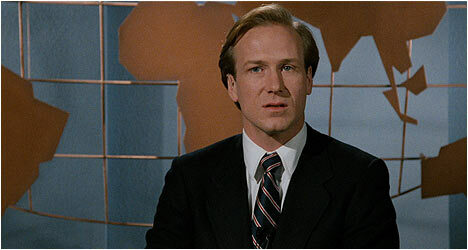 Broadcast News is a film of its time, capturing the state of flux that network news was in. Early on, Brooks lays out his views of what’s happening to T.V. news at a conference Jane is speaking at. While she warns of their profession being in danger, people talk amongst themselves or get up and leave forcing her to skip over topics, like trends involving magazine shows and news as profit. Her biggest reaction comes from showing a clip of an elaborate display of dominoes that all the networks showed in favor of an important government policy change. This scene warns of a future that has now happened, making Brooks’ film quite prescient. As is customary with Brooks’ films, there are some spot-on observations about relationships, like when Aaron says to Jane at one point, “Wouldn’t this be a great world if insecurity and desperation made us more attractive? If needy were a turn-on?” It’s funny because it’s true. In addition to witty dialogue, Broadcast News also has its moments of hilarious physical comedy, like the classic scene where Joan Cusack races through the newsroom to get a taped news story to the control room seconds before it is supposed to air. There are little moments, like, en route, where she accidently bangs into a water fountain that makes this sequence so funny to watch. In a wonderful bit of then casting against type, William Hurt plays a good-looking blank slate of a person. Tom means well and really tries to understand the things Jane and Aaron say but he just doesn’t get it and is unable to articulate himself properly. Hurt could have easily played his character’s shallowness for laughs but there is an earnestness there that is endearing but this disappears as he becomes more savvy in his profession. Fresh from her hilarious turn in the Coen brothers’ Raising Arizona (1987), Holly Hunter is ideally cast as the chatty Jane, a person who says exactly what she means even if it hurts someone else’s feelings. Yet, Hunter also shows Jane’s vulnerable side – her awkwardness when it comes to personal relationships. Albert Brooks nails the smug, smartass qualities that Aaron possesses and how it masks his insecurities when it comes to his romantic feelings for Jane. He clearly loves her but can’t find a way to get past that “best friend” stage of their relationship. The first disc includes an audio commentary with writer-director-producer James L. Brooks and editor Richard Marks. Rather appropriately, Brooks starts off with talking about the genesis of the film and how the success of Terms of Endearment affected it. He points out the bits in the film that came from his extensive research and touches upon the casting of the lead roles – for example, Holly Hunter was a last minute addition. Brooks is refreshingly candid and tells all kinds of fascinating filming anecdotes. The second disc starts off with a 36-minute documentary entitled, James L. Brooks – A Singular Voice, with past collaborators singing his praises. It starts off with his trailblazing work in T.V. with 227, The Mary Tyler Moore Show and The Simpsons and how he helped change the medium. It also examines his transition into film and the success of Terms and how it led to Broadcast News. There is an alternate ending and 19 minutes of deleted scenes with optional commentary by Brooks. The ending is quite visceral and emotionally raw but is fascinating alternative to what is in the final film. For the deleted footage, Brooks talks about why it was cut and puts it into context. Interestingly, an entire subplot involving Tom and his news source was cut out. Also included is an interview with Susan Zirinsky, a veteran CBS News producer, one of the models for Jane in the film, and an advisor and associate producer. She talks about meeting Brooks for the first time as well as telling amusing and engaging anecdotes that really shed light on how truthful the film is about journalism. This is a fantastic extra and one of the highlights of this edition. There is a promotional featurette done at the time of the film’s release that, at times, plays like an extended trailer only with perceptive interview soundbites from Brooks and the cast. Still, it is interesting to watch. Even better is additional interviews and on-set footage not included in the featurette that runs an impressive 18 minutes. It provides quite a bit of insight into Brooks’ intentions and how the film got made.